You like? It's the latest in 2010 fashion. On Saturday Marshall and I were in his Brand. New. Acura. TL. (that still had dealer plates on it) stopped at a light, when we were rear-ended by a big work van. Thankfully the kids were at the in-laws' house and thankfully the man had insurance and actually stopped. FYI, Los Angeles is hit & run capital of the world, with the large number of uninsured motorists. The car has a damaged bumper but is otherwise ok. As soon as we got back in the car, we noticed our necks and backs were hurting. The irony... I'm currently going to Physical Therapy for a years old car accident for my neck and back. We had worked our way down to one PT visit a week. *sigh* I'm guessing my pre-existing injury has a lot to do with the state of my back and neck now. We both went to the UrgentCare and were treated for Whiplash. 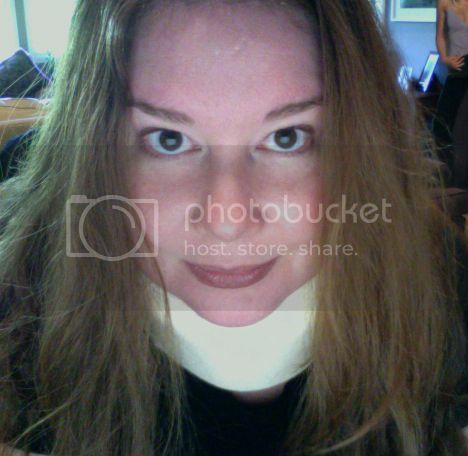 While Marshall escaped the chance for public humiliation, I was given this lovely cervical collar to use. I'm heading to my primary care doc today and my Physical Therapist tomorrow, to find out how long I need to wear this super nifty accessory. Now if only I could find a way to make it purple. OUCH! Glad it wasn't too bad and that the kiddos weren't in the car!!! Just wrap a big purple scarf around that collar and you are good to go!!! Rit Dye? Perhaps that will make it purple? OMG, I'm just now catching up in my reading - I'm so sorry! Glad you're ok, and that u solved ur dilemma!